Measure and improve Customer Experience with Wizu. The innovative and engaging way to find out how your customers feel about you. Wizu can help you create a compelling competitive advantage by putting your customers first and improving your Customer Experience (CX). A good customer experience strategy can help you retain more customers so what exactly is it and why is it so important? Forrester Research defines customer experience as: “How customers perceive their interactions with your company.” CX involves the integration of physical, emotional and psychological processes that occur throughout the customer journey. Understanding the customer experience is a hugely important part of customer relationship management. Typically surveys, feedback forms and other methods of data collection techniques have been utilised to help companies to determine the customer experience. 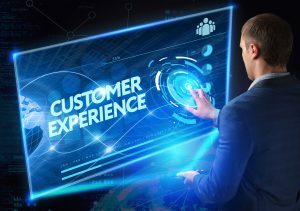 To truly be successful in the long term, customer experience needs to be seen as the overall picture of how customers engage with your company throughout the entire arc of being a customer. Just taking a snapshot in time can give you some insight but you are not truly understanding the full customer journey. Take a look at our animated guide to Customer Experience below. One of the most important aspects of CX is emotion. How an experience makes customers feel influences customer loyalty more than effectiveness or ease. Most CX measurement tools focus on metrics that reflect a rational evaluation of experiences. Measuring emotions is difficult. A customers’ emotional reaction to an event depends on context and emotions can be fleeting so the window to measure them is small. Often you are relying on how a customer remembers emotions too so this can distort results. Wizu offers a new approach to measuring CX. Our engaging conversations aim to measure emotions better than existing CX measurement tools by offering features such as allowing the customer to choose an emotion that matches how they feel, using text analysis to interpret their emotions from the language they use and offering an ‘always on’ feedback solution that will allow customers to interact with you in their moment of need. This increases your chances of capturing the true customer emotion and also helps the customer feel like their feedback is important to you. Wizu also offers personalization in surveys ensuring customers are answering questions in context and feel more engaged. Only by measuring emotions can you avoid negative emotions and validate positive emotions in experiences helping you to improve the overall customer experience. Create your own conversation to measure customer experience by signing up for your commitment free, 30-day free trial.